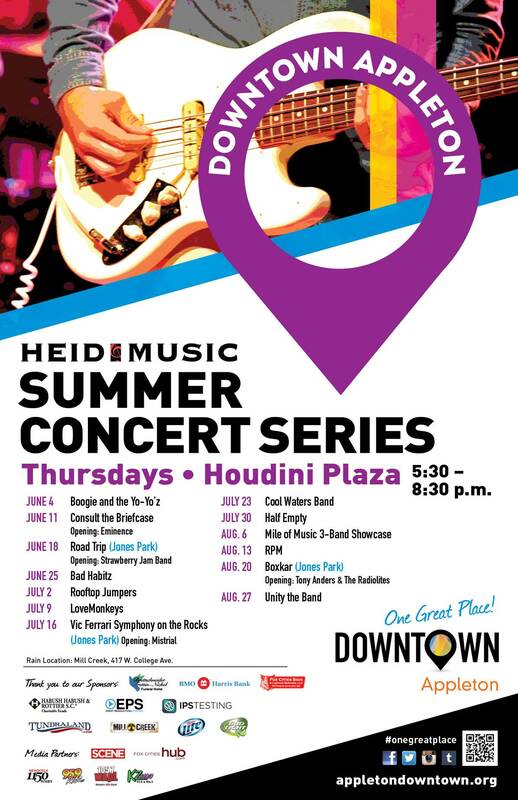 Posted on Jun 10, 2015 by Appleton Downtown Inc.
Move and groove to the music of the summer on center stage in Downtown Appleton!. Your favorite adult malt beverages, soda and water will all be available, along with food from your favorite Downtown bars, restaurants and vendors in the park. While you are here, stop at the many Downtown businesses open later for you! And ask about wristband specials for after the concerts at your favorite nightlife locations! Plenty of Parking in nearby ramps for just $2. Please note: per City of Appleton ordinance, no dogs are allowed. AND IF THAT STILL ISN'T ENOUGH LIVE MUSIC, CHECK OUR LIVE MUSIC PAGEOR CALENDAR OF EVENTS FOR MORE OPTIONS!